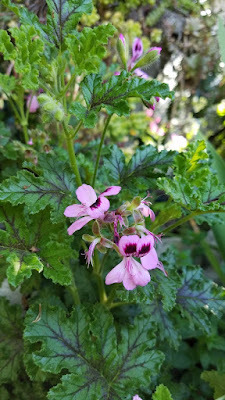 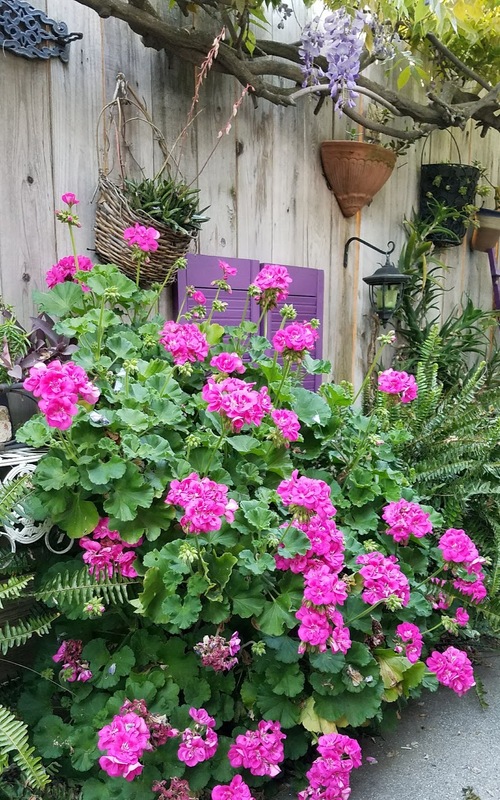 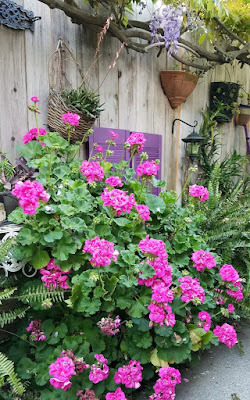 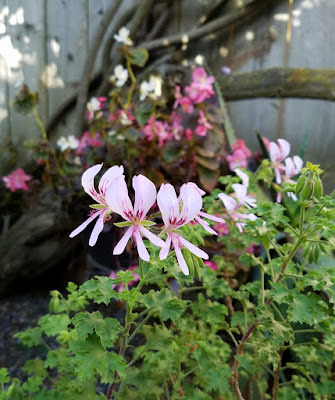 ...as are the common pelargoniums. 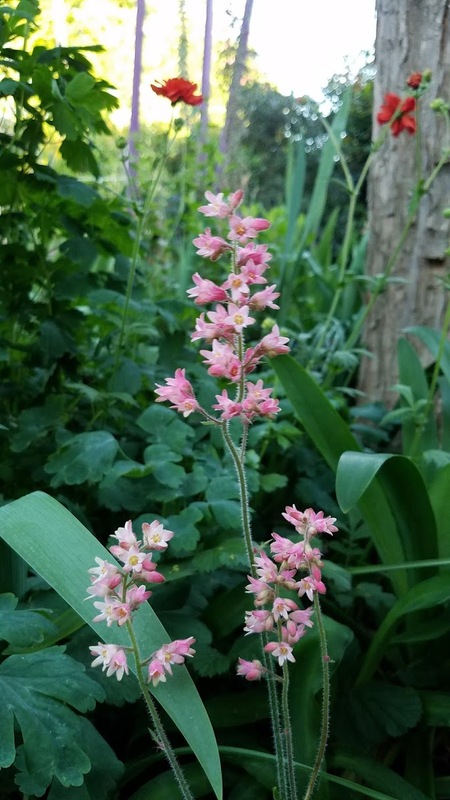 In the maple tree bed Orthrosanthus multiflorus "Morning Flag" has come into its own after settling in for a little over a year. 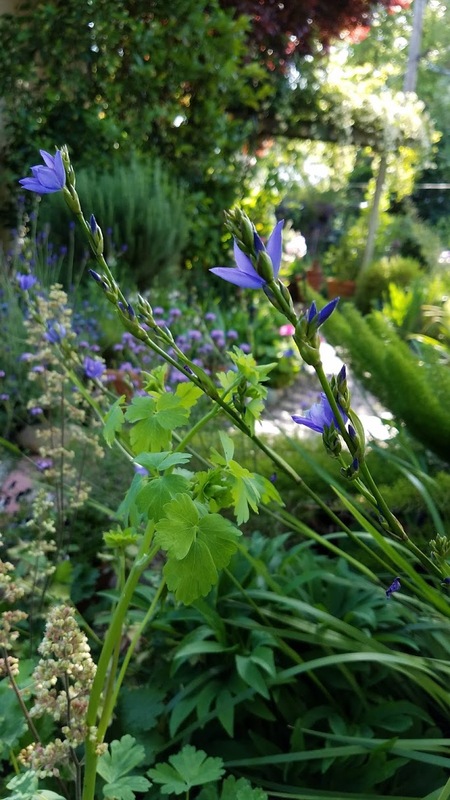 Last year's 3 bloom stalks between 2 plants have multiplied greatly and the blue is a nice addition to the yellow columbine. 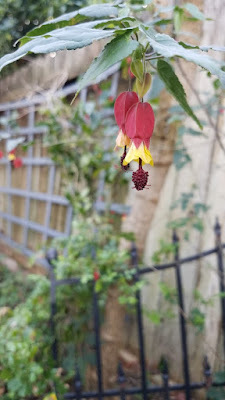 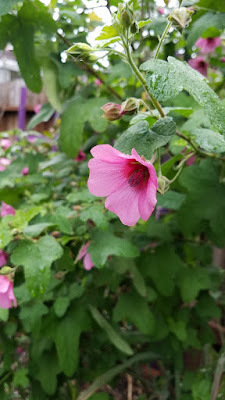 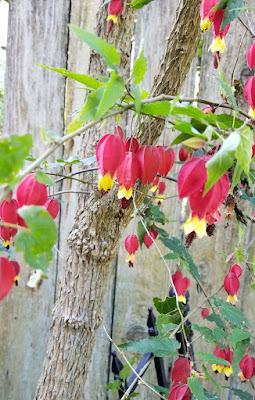 This abutilon had much smaller flowers than most and has bloomed much of the winter. 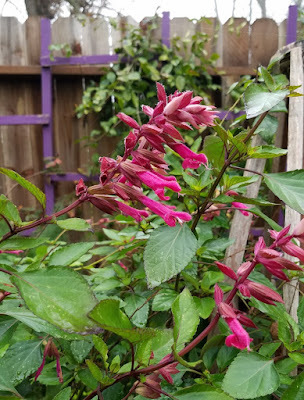 Too bad I can't find the tag...but the hummingbirds have found the plant and that is all that matters. 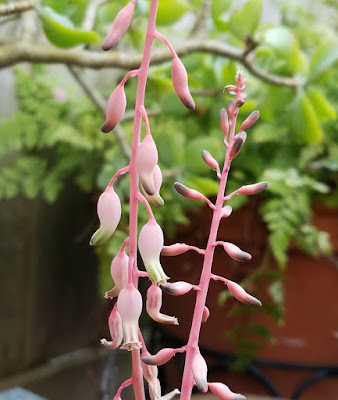 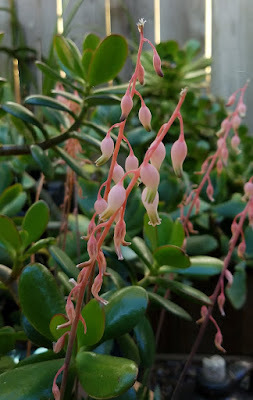 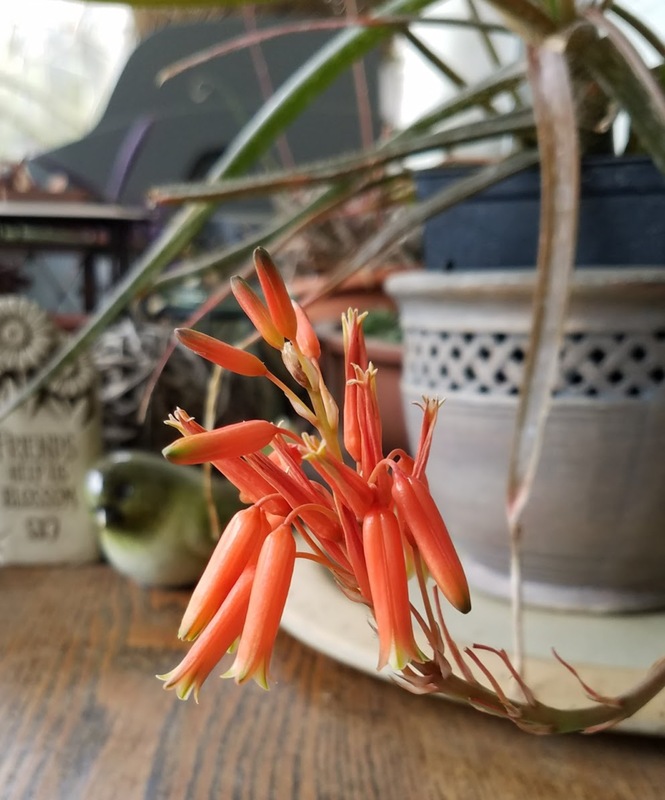 I do however had some pretty gasterias in bloom, here, gasteria liliputana. 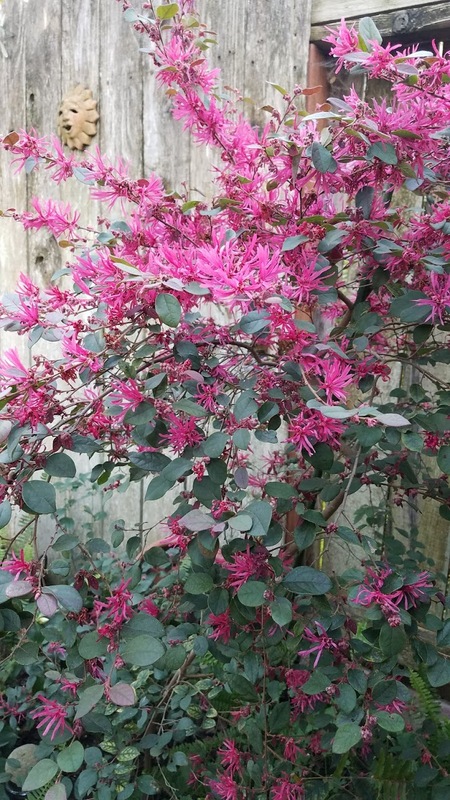 That probably isn't happening in North Devon. 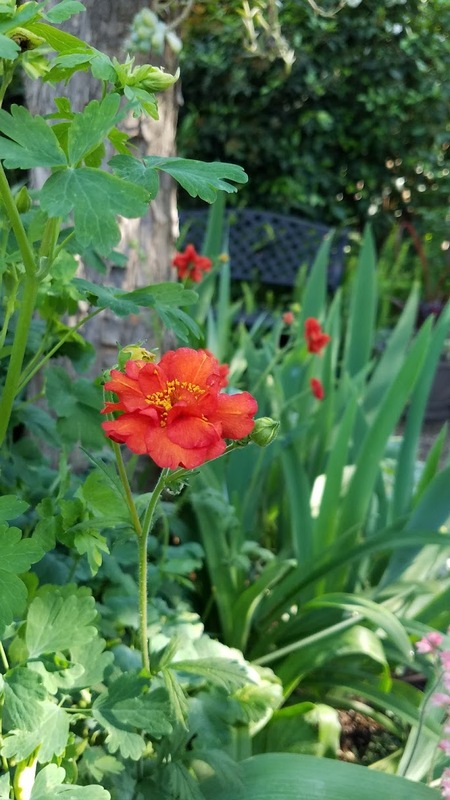 Geums are just starting up, here a passalong from a friend. 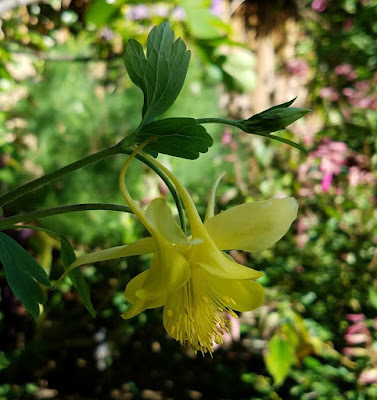 The yellow columbine, originally a passalong, that has now spread gently everywhere has also just begun to bloom. This year the heucheras are especially happy, probably because the rain has been good. 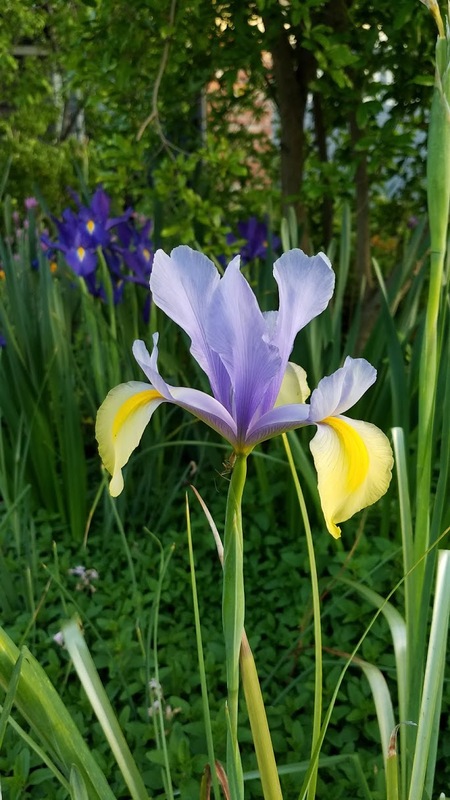 I love this dutch iris...my favorite combination of blue and yellow and although I have planted many I seem to have only this one this year. Lots of plain blue but...I want more of these! 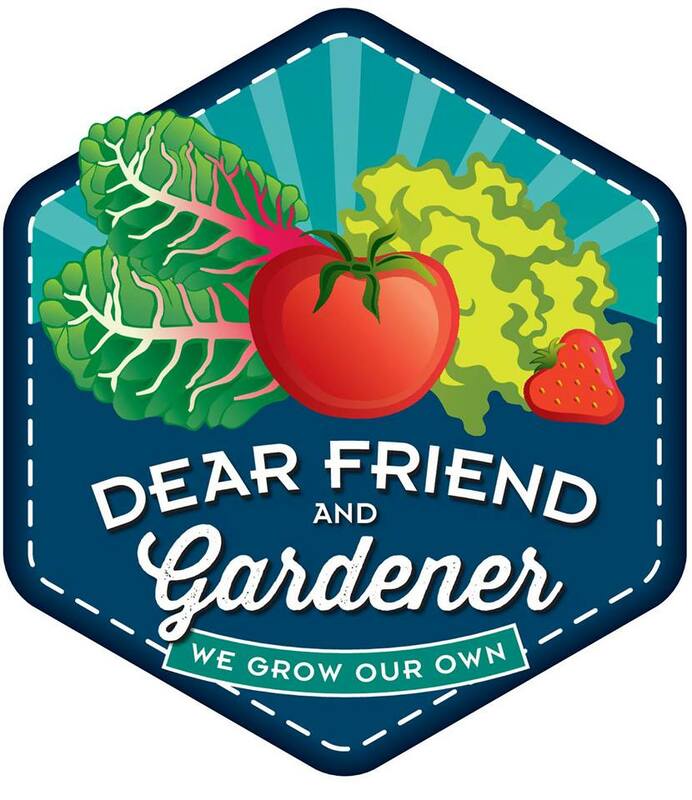 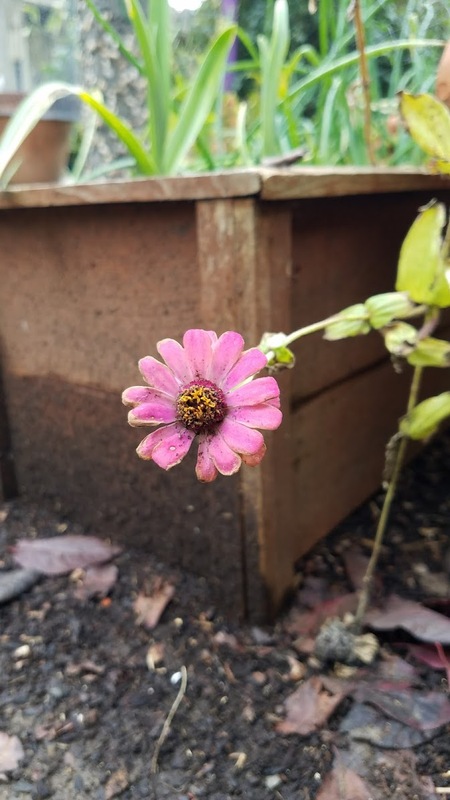 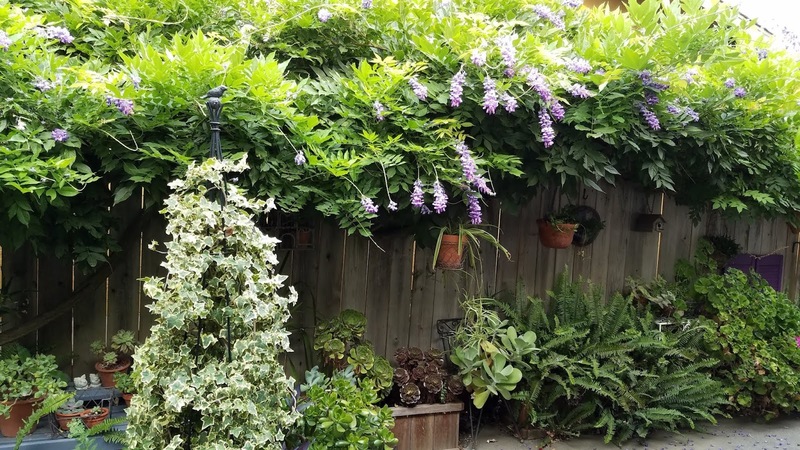 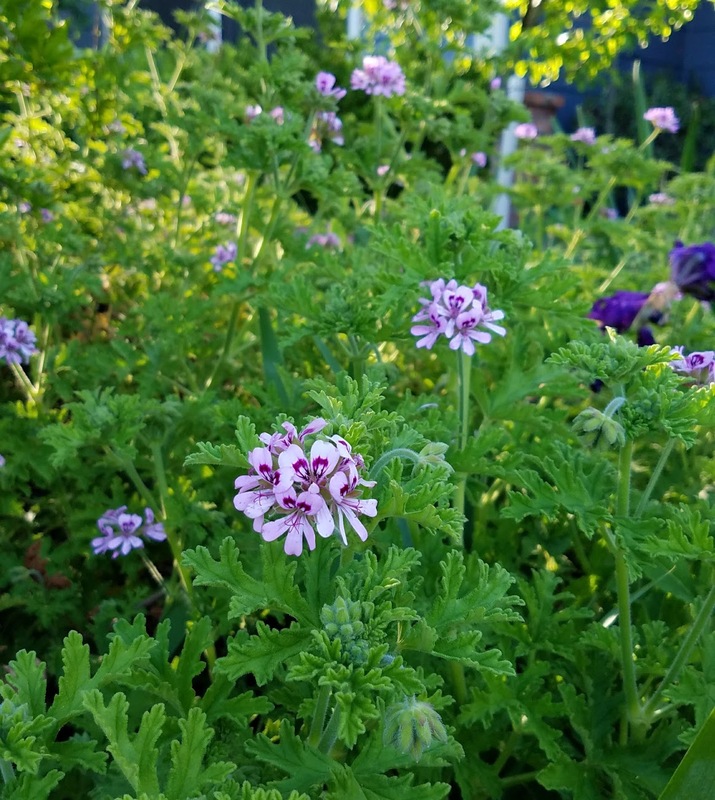 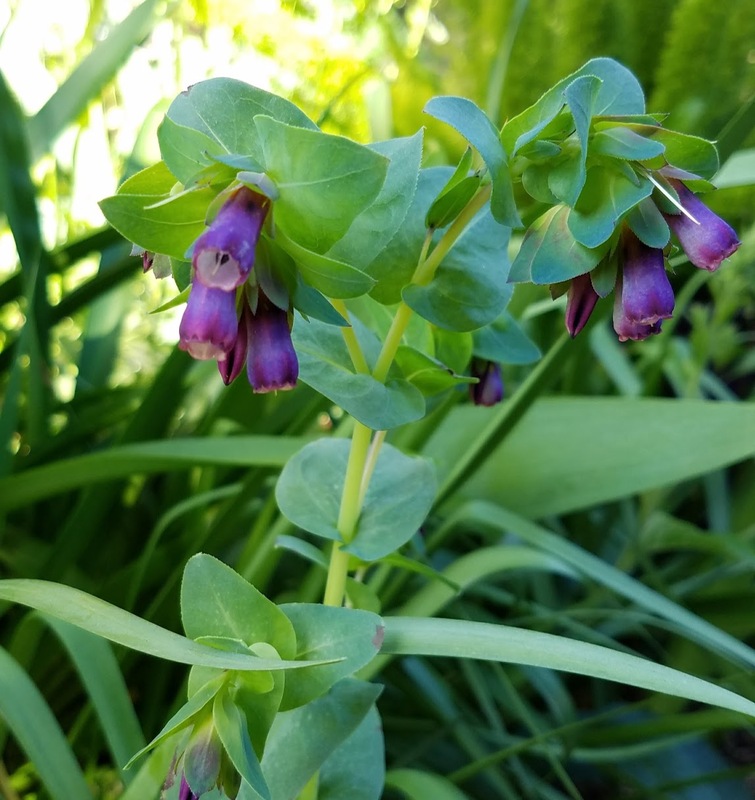 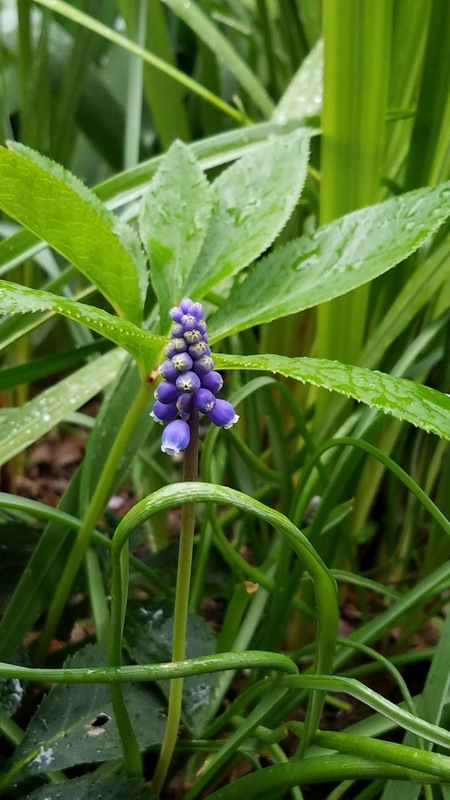 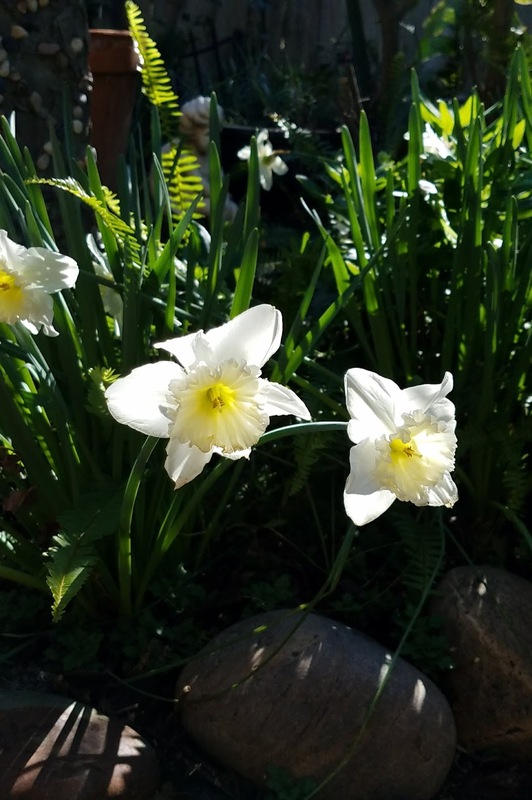 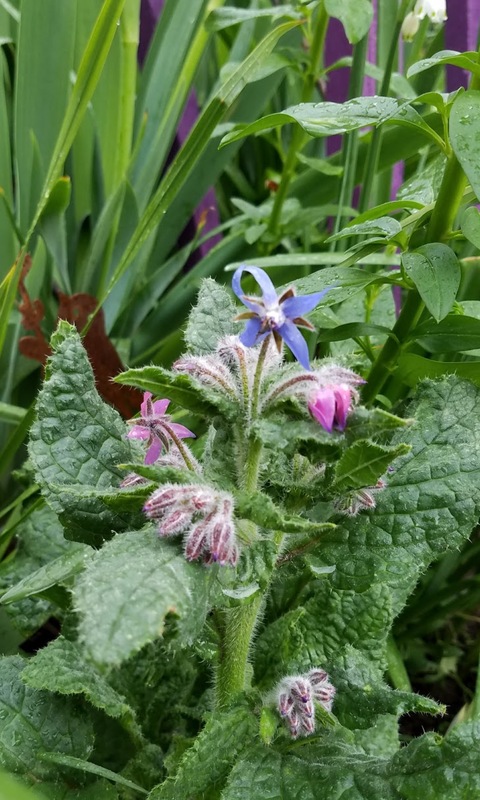 For more spring blooms visit Carol at May Dreams Gardens and follow the links! While it is far from spring and we need more winter (as in lots more rain) no one told the plants. 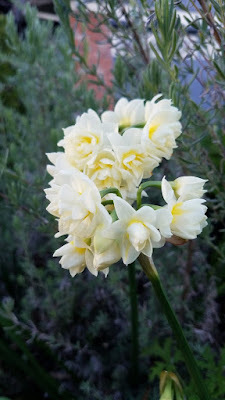 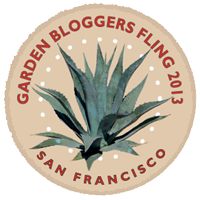 So the garden is celebrating and one of the biggest shows is the narcissus of various design. 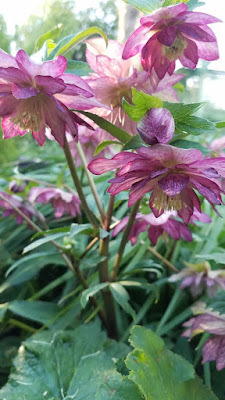 There are also quite a few hellebores of various shades of pink for the most part. 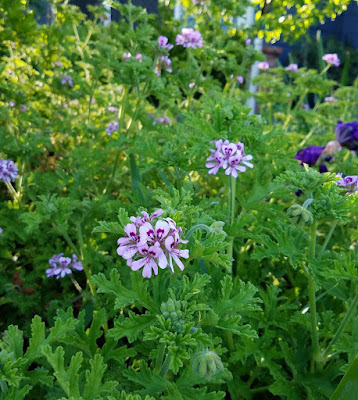 I have one white variety but it just doesn't show up as well as the pinks. 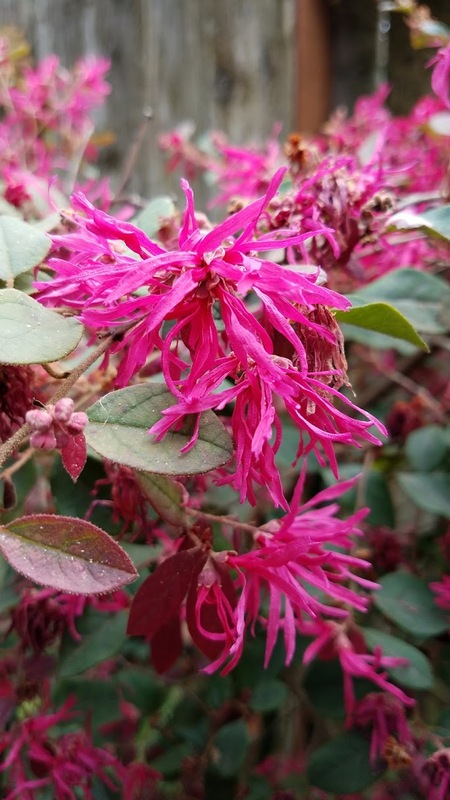 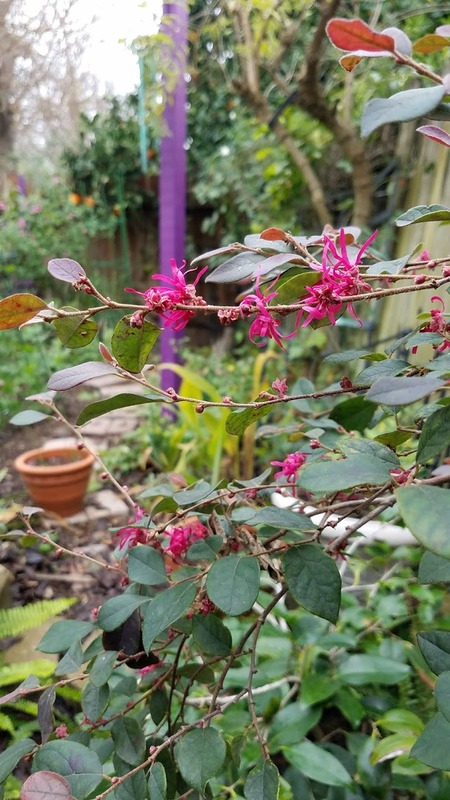 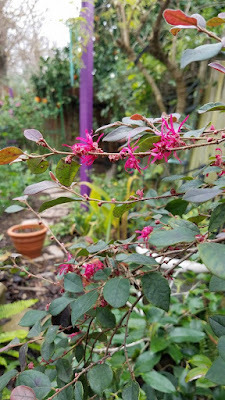 The loropetalum is in full bloom earlier than normal as well. 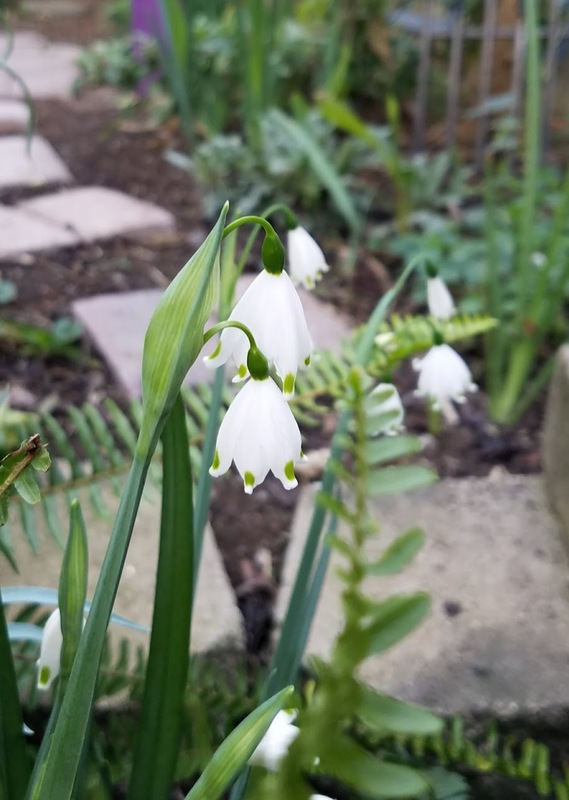 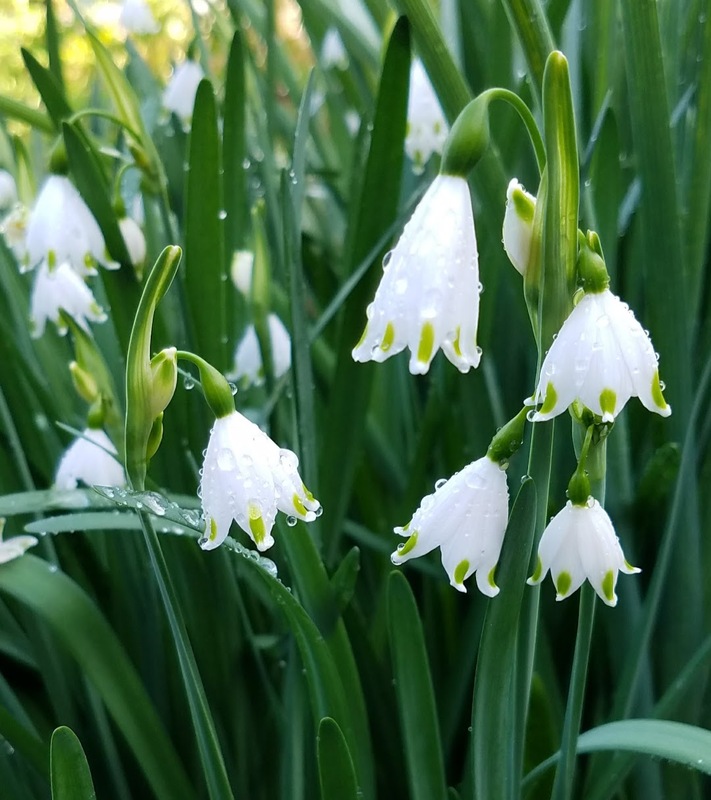 Leucojum, which I grow in place of snowdrops, are everywhere. 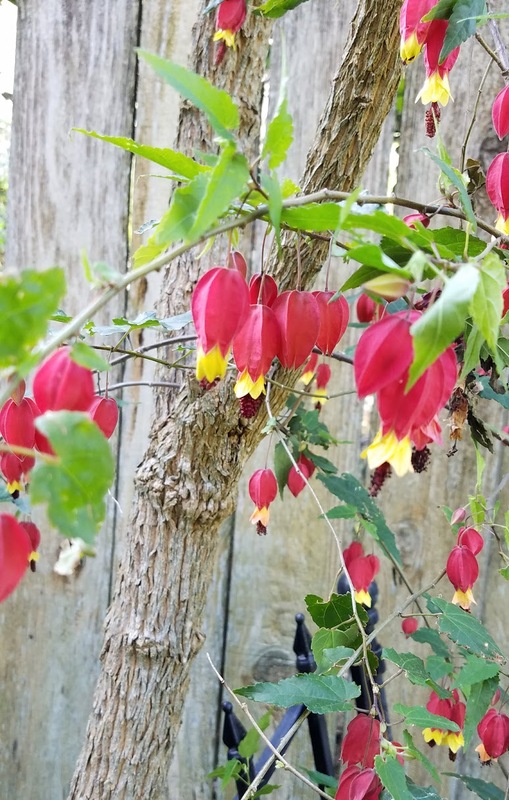 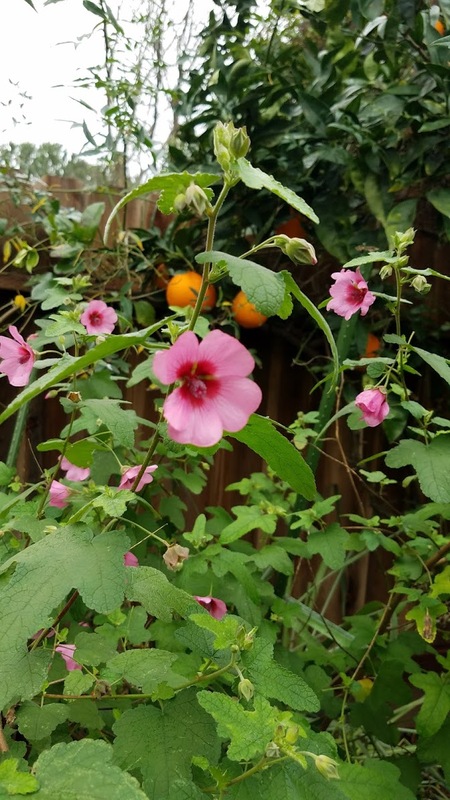 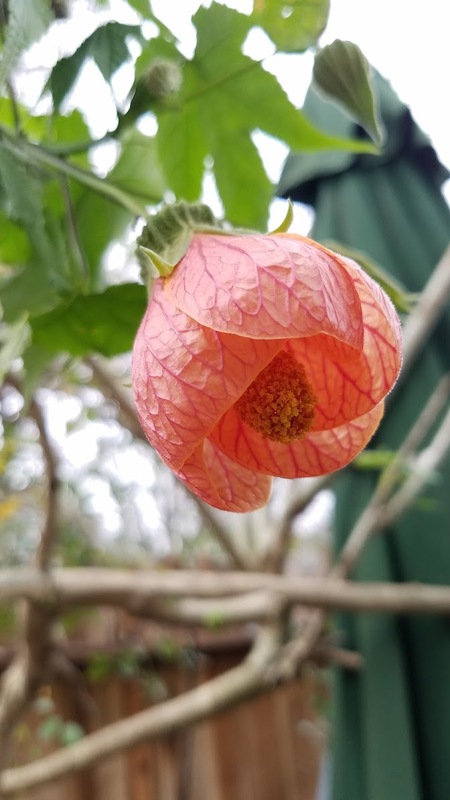 This sweet abutilon, whose name escapes me, has gotten scraggly and will need a bit of pruning but I am waiting until it really is spring. In the meanwhile it has quite a few hummingbird attracting blooms at the ends of long branches. 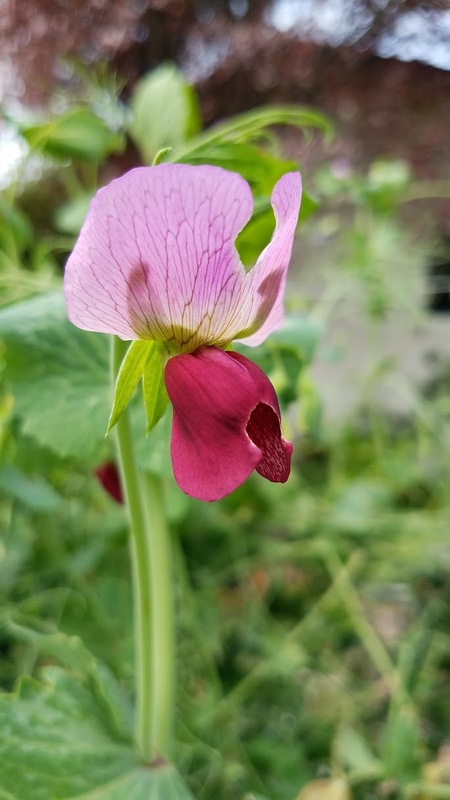 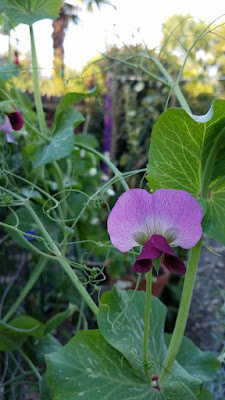 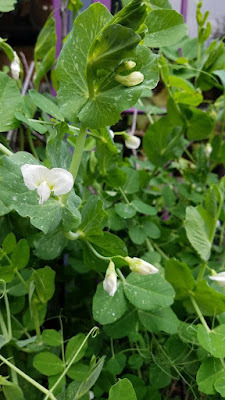 Sugar Magnolia snap pea has the prettiest blooms and makes me a bit less sad that I think all my sweet peas got eaten. 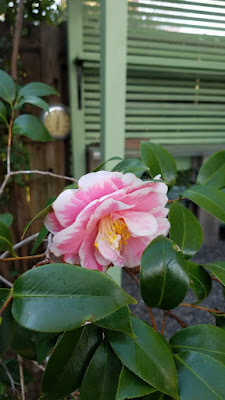 The camellias are covered in buds and were it not for Bloom Day I might have missed the fact that some have opened! 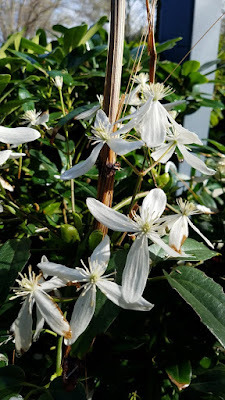 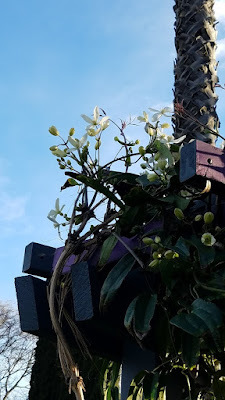 Up on top of the arbor I noticed the evergreen clematis blooms (above) from inside the house. 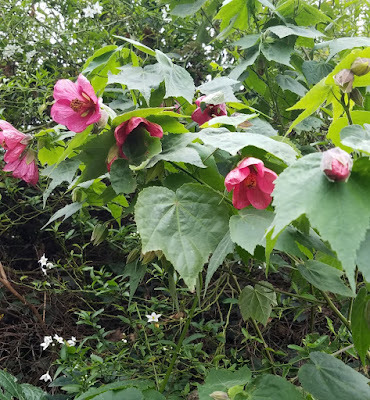 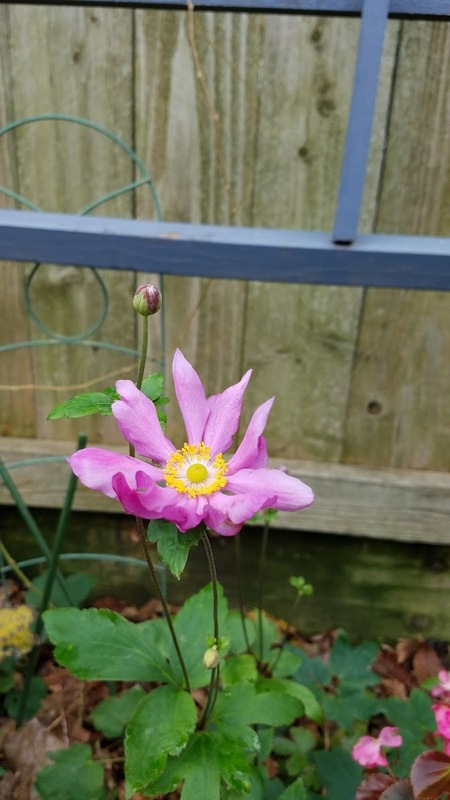 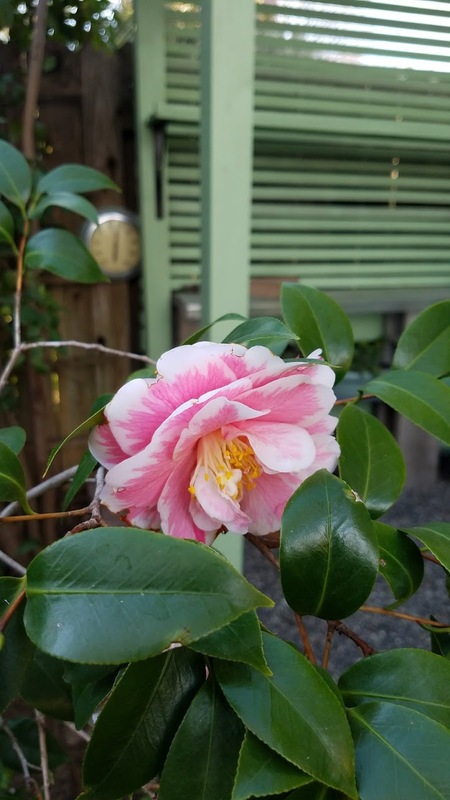 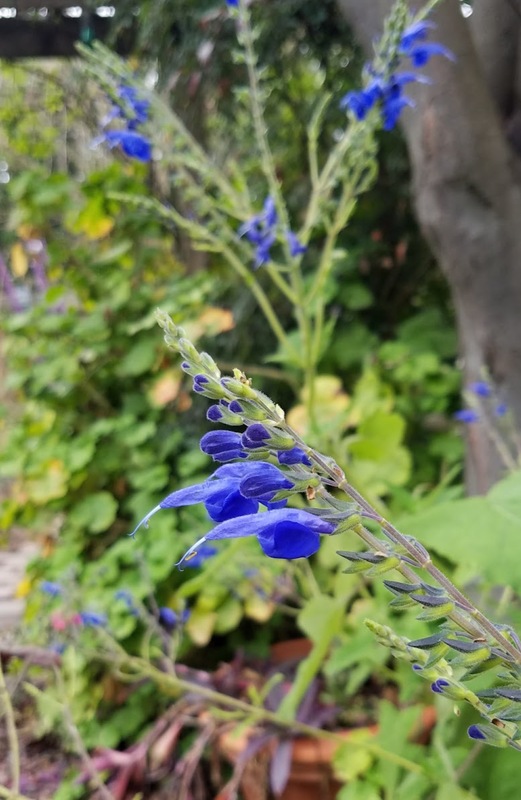 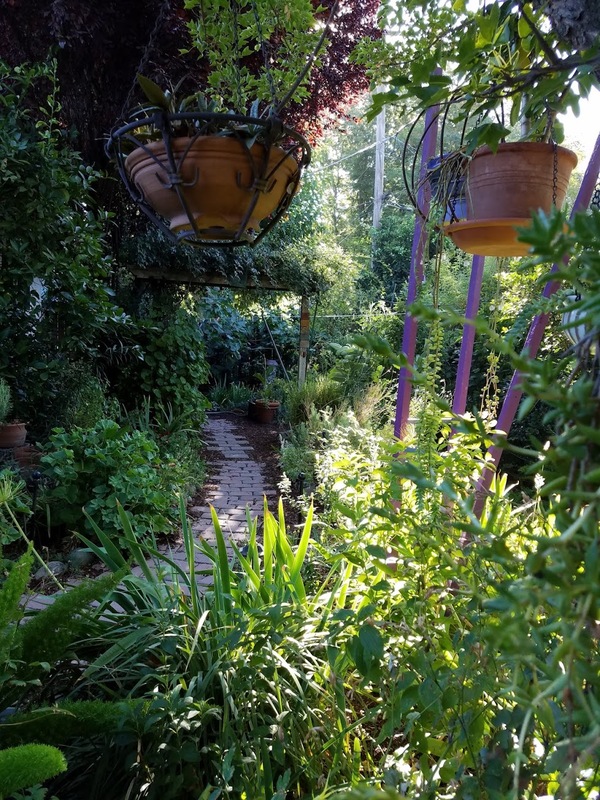 This plant got cut way back in building the new arbor so it is not as floriferous as some years but it still brightens up the side path. 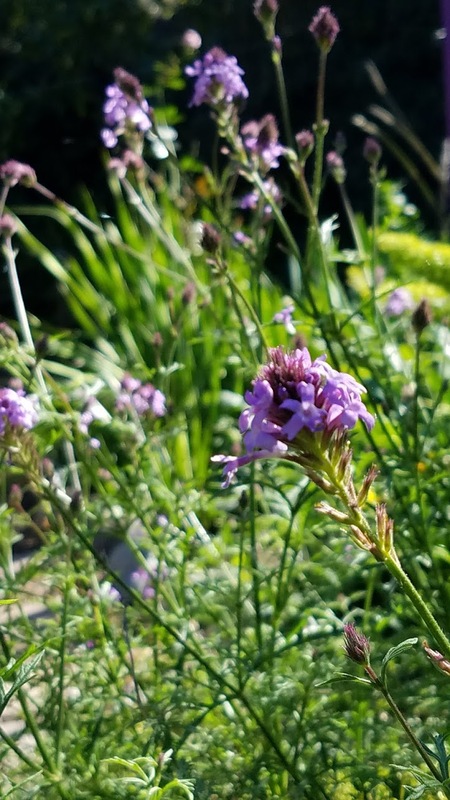 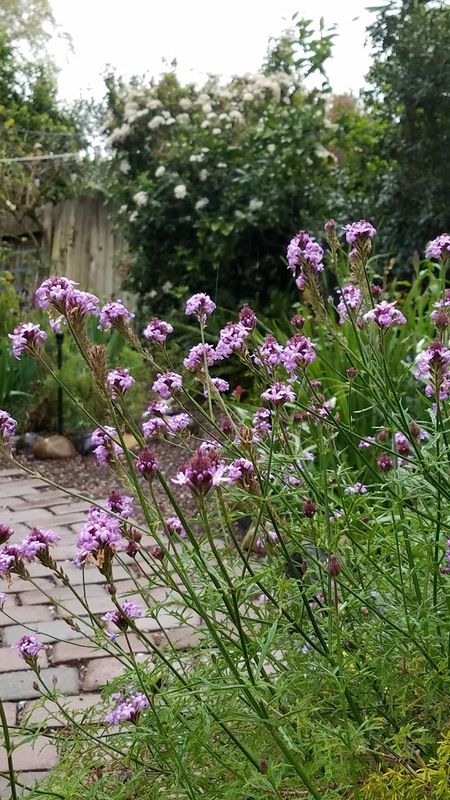 Meanwhile, the verbena lilacina 'De La Mina' (below) brightens up the back path. 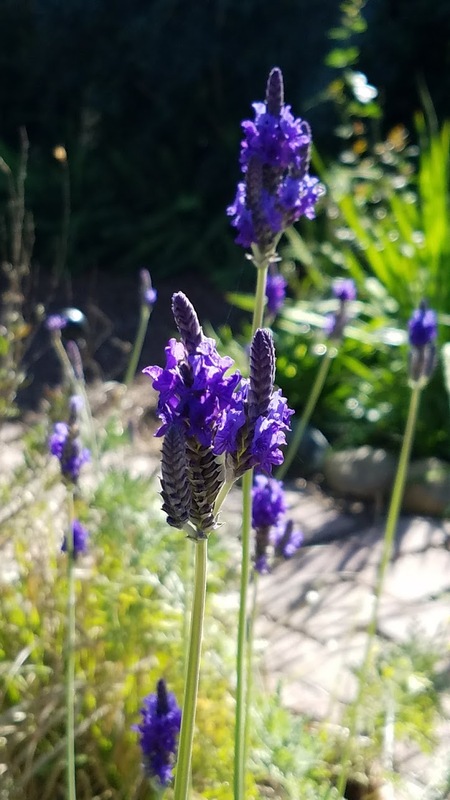 Fern Leaf lavender is a workhorse here. 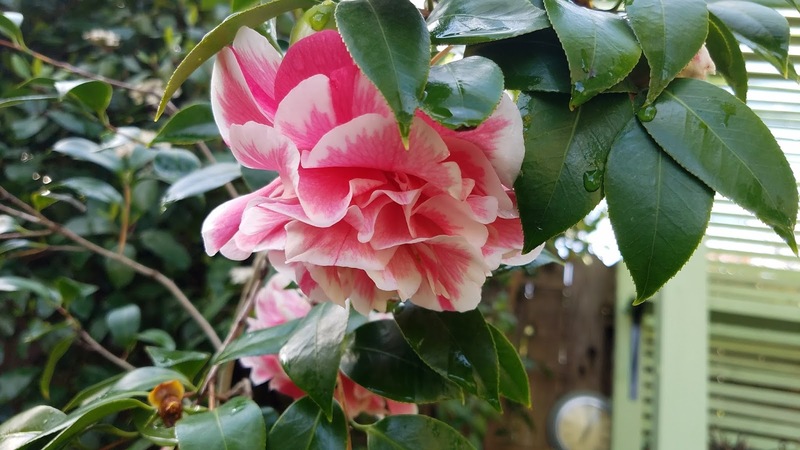 I used to baby it but, maybe thanks to climate change, it seems to bloom a huge part of the year and never more vibrantly than in winter. 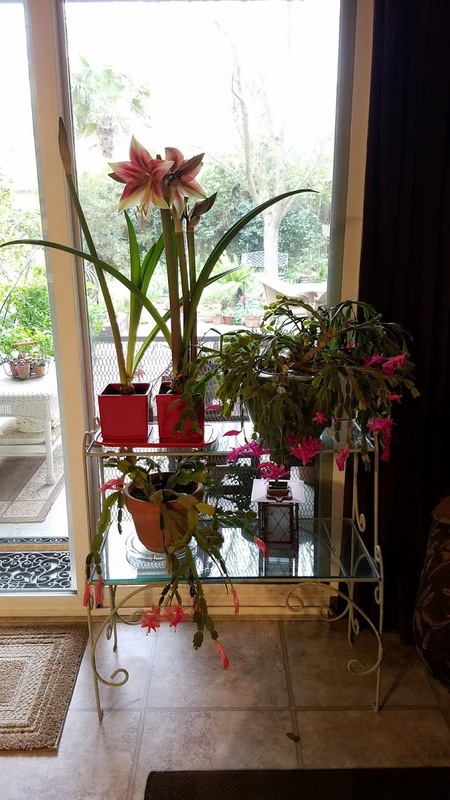 I have taken cuttings and it is now in several places so I think it is pretty safe here. Although, if we ever get back to a good freeze like the olden days I will definitely cover at least one of them! 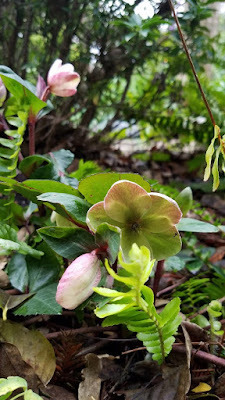 Elsewhere more abutilons, narcissus, hellebores, pelargoniums, pansies, and the stray mutant iris (that have bloomed all winter) add to the color party. 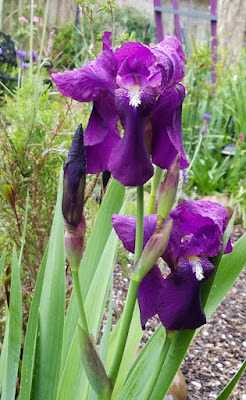 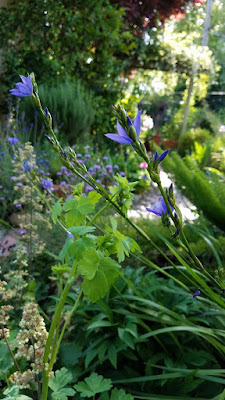 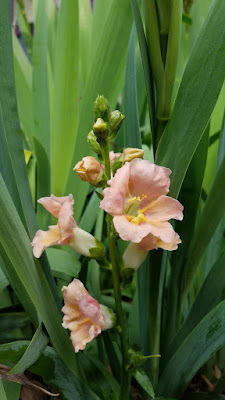 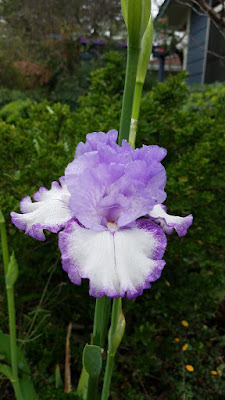 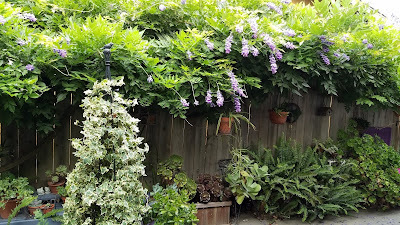 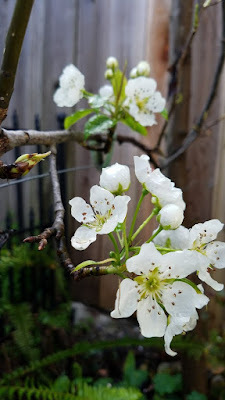 For more blooms in other gardens visit Carol at May Dreams Gardens and follow the links there. 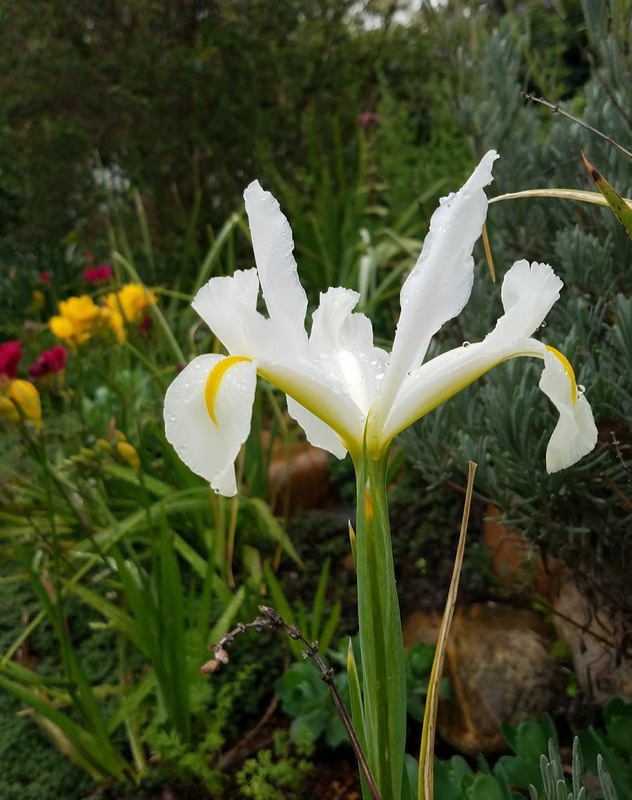 Thanks to Carol for hosting Bloom Day year after year so that we remember to check our gardens well and not miss those blooms!